As soon as you close your eyes and fall asleep slowly, you have this sensation of falling from a height or from some stairs and it jolts you awake. So you’ve had a long, rough day and you dim out the lights, set the room temperature, pull over your quilt, comfort yourself under the sheets and begin your sweet and calming journey towards your favorite dreamland. As soon as you close your eyes and fall asleep slowly, you have this sensation of falling from a height or from some stairs and it jolts you awake. Ouch, why did that happen? As you fall asleep slowly, your heart rate slows down, your breathing rate decreases and your body temperature drops. The twitch in the muscles occur due to the downshifting of the nervous system and these transitions. 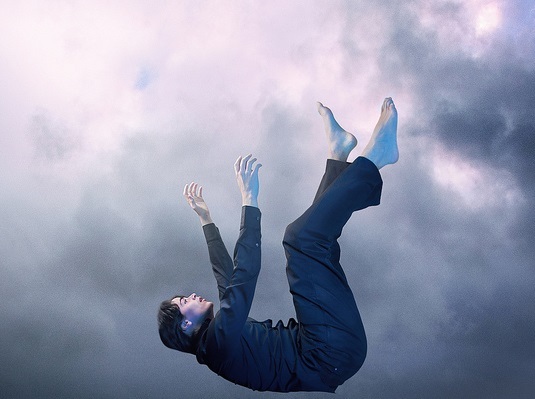 The irregular sleep cycle or less sleep as well as anxiety, stress, fatigue and worry can trigger this sensation of ‘falling from height’ or ‘shock’ right before you fall asleep, and that can momentarily wake you up. Caffeine and other strong drinks can also affect your sleep cycle and cause such disturbances to your sleep. A research on hypnic jerk suggests that "an archaic reflex to the brain's misinterpretation of muscle relaxation with the onset of sleep as a signal that a sleeping primate is falling out of a tree. The reflex may also have had selective value by having the sleeper readjust or review his or her sleeping position in a nest or on a branch in order to assure that a fall did not occur." Which literally means that your brain misunderstands the relaxing of your muscles as a symbol of actually falling and tenses up your muscles in order to brace you for the fall. In other words, it makes you feel like you’re falling in order to make sure you don’t fall. Funny, right? This involuntary moment or miscommunication between your muscles and your brain is so common that 70% of people face it occasionally. This is not a serious health or medical disease and so it doesn’t have any harmful effects on your sleep or your health. So if you face anything like this again, just go back to your dream world without thinking much.